Although nominally head of the design team, Blume delegated the entire project to Rüdiger Kosin, chief of the company’s aerodynamics department. His team included Hans Rebeski, Hugo Wenzel, Franz Meyer and Walter Lehmann. Since they were simultaneously involved in developing the Ar 232 transport and Ar 240 ‘destroyer’ aircraft, it took almost a year to complete the initial studies. In October 1941, they presented a project designated E.370/IV, for a single-seat, cantilever high-wing monoplane of monocoque construction, with straight wings and single-fin tail unit. The aircraft was to be propelled by two BMW P 3302 jet engines located in underwing nacelles. The fuselage, of cylindrical cross-section, was to house a pressurized cockpit, three fuel tanks and two Rb 50/30 (or Rb 70/30) photographic cameras. Defensive armament was to consist of one fixed 13 mm MG 131 machine gun mounted in the aft fuselage. Total fuel capacity was 4000 liters. The design of the aircraft’s landing gear changed several times. The team worked on several solutions: a single retractable fuselage skid; a bogie of small auxiliary wheels mounted underneath the fuselage (as in the Ar 232 transport) with skids beneath the engine nacelles; and a tricycle take-off trolley combined with retractable landing skids mounted beneath the fuselage and engine nacelles. Eventually, the last variant was chosen. The rather basic landing gear had its advantages – it constituted only 3% of the aircraft’s take-off weight. In late October 1941, Obstlt. Theodor Rowehl, the commander of Aufklärungsgruppe Oberkommando der Luftwaffe (the German Air Force HQ reconnaissance unit) joined a meeting held by the Arado engineering team. His unit, hitherto flying twin-engined Junkers Ju 86Rs as high-altitude reconnaissance machines, was to be the main recipient of the new design. Rowehl, well aware that the Ju 86R’s weakness was its lack of speed, was keenly interested in the new aircraft and expressed a favorable opinion about the project. His views were instrumental in persuading the Technisches Amt of the Reich Air Ministry to approve the E.370/IV for production, on 24th October 1941. On 17th November 1941, Ernst Udet, the Generalluftzeugmeister and head of the RLM’s T‑Amt, committed suicide. It had seemed likely that the Arado project would be shelved, but events were to take another course. On 4th February 1941, Udet’s successor, Generalfeldmarschall Erhard Milch visited the Arado plant in Brandenburg and was shown the E.370/IV project. Milch was greatly impressed by it and ordered a full-scale wooden mock-up to be built, designated 8-234 by the RLM. In April the RLM ordered six prototypes, designated Arado Ar 234. The RLM requested that the new design have a range of 2150 km, a maximum speed of over 770 kph at 6000 meters and a service ceiling of up to 11,000 meters. Throughout 1942 the Ar 234 was submitted to many tests in the aerodynamic tunnel of the Arado plant. They proved very satisfactory. However, the BMW 109003 engines, which were to become the aircraft’s powerplants, were still under-developed. As they grew in diameter, new, wider engine nacelles became necessary, which affected the aerodynamics of the aircraft. Even worse, the BMW engines’ thrust turned out to be lower than predicted. Hence, the design team was left with little option but look for an alternative powerplant for their aircraft. They decided to employ the Junkers Jumo 109004 turbojet. Since this engine was even bigger than the BMW 109003, the aircraft’s wings had to be re-designed. Wing area was slightly increased and the flaps and ailerons re-shaped; the wings’ leading and trailing edges were also re-worked. Fuel load was split among three fuselage cells with a total capacity of 3700 liters. Defensive armament was deleted; only a 15 mm armored plate mounted behind the pilot’s headrest remained as passive protection. On 28th December 1942 the T-Amt ordered an additional 14 prototypes, increasing the overall number to 20. However, the RLM’s representatives were dissatisfied with the aircraft’s unconventional undercarriage system, consisting of a take-off trolley and landing skids. 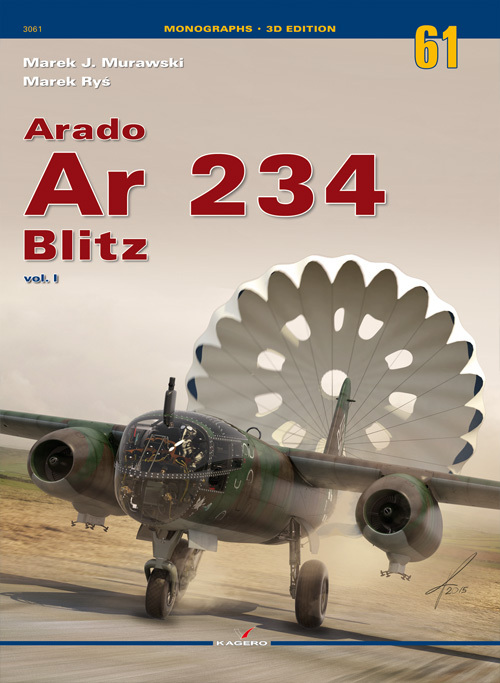 In order to meet their demands, the Arado design bureau prepared another Ar 234 variant in January 1943, designated E.371. It was equipped with a classic tricycle landing gear with front wheel. The fuselage had to be widened by 21 cm in order to accommodate the retractable undercarriage. Wheel well bays were installed in place of the 775-liter central fuel tank. The project was approved by the T-Amt and on 9th February 1943 it ordered two prototypes. The new variant, designated Ar 234B, was to be a bomber version of the basic reconnaissance design. In the latter part of February 1943 the sixth and seventh specimens of the Jumo 004A-0 engine were delivered to the Arado company. In the spring of the same year the Brandenburg plant assembled a further four prototypes. Tests of the delivered Jumo 004 showed that the expected thrust of 850 kG (8.3 kN) was unattainable. The demand for more thrust necessitated the use of auxiliary external Rauchgerät Walter HWK 109 500 rocket boosters, which provided an additional 500 kG (4,6 kN) of thrust for 30 seconds. Once their fuel was consumed, the boosters were parachuted to the ground. 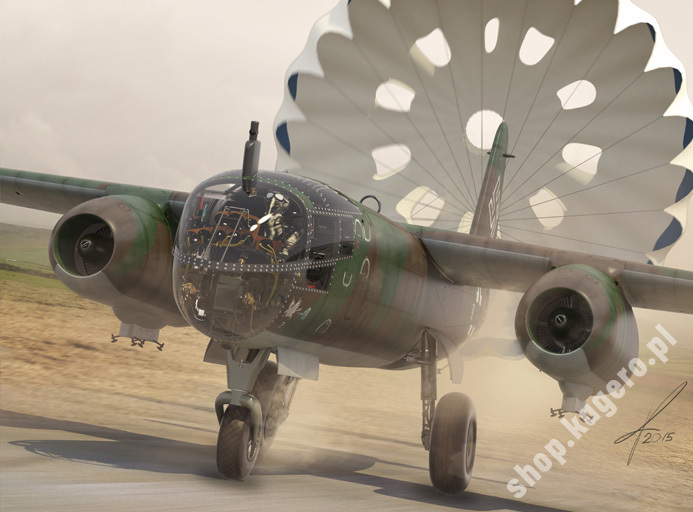 Another alternative proposed by Arado was the installation of four BMW 003A-0 engines, instead of two Jumo 004 engines. Although the BMW engine’s thrust was smaller by 50 kG, it was 250 kg lighter than its Junkers counterpart. Nevertheless, this project had to be shelved until the BMW powerplants were reliable enough to be mass-produced. The engines worked faultlessly. They were surprisingly quiet in comparison to piston engines. Their noise was barely audible in the cockpit and the vibration of the airframe minimal. The retraction mechanism of the main landing skid worked as intended. However, neither of the two stabilizing skids snapped up into the locked position. During the flight they constantly “pumped” up and down. When I turned or climbed, they extended fully down and jammed in that position.